Just like storage problems have plagued the office twenty years ago, the modern workplace is still having troubles storing their information – only now it faces how to store data on your computer instead of storing physical files in a dusty room. Many organizations fail to realize that your information technology (IT) performance strongly affects how well your business performs. Fortunately, solid state storage made from NAND flash memory chips has evolved to the point where many organizations are considering its use to replace inefficient, slow mechanical-spinning systems. The role of data storage systems plays a vital role in achieving important objectives, improves customer service and leads to faster decision-making. 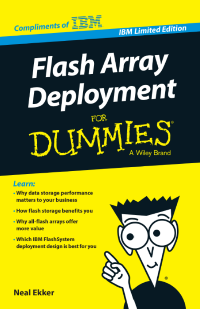 If you’re not sure what flash storage system is right for you, the book Flash Array Deployment For Dummies tackles the data storage challenges of enterprises, and how they can make it a successful, cost? effective part of their data center. Download this exclusive eBook to learn more about the data storage limitations driving businesses to look at flash storage and find out why data storage performance matters. Is your organization spending more time and money on securing your data instead of investing in resources and innovations that will drive your business forward? IBM data protection solutions can help your business realize a significant return on investment. From dealing with tracking duplicate files on your virtual machines, servers and applications though IBM Deduplication Solutions to advanced cloud data protection capabilities with IBM Cloud Managed Backup – your business will realize a cost savings of up to 38 percent less in backup infrastructure costs alone. IBM data protection software enables VMware administrators to easily perform data protection and recovery operations, and helps save organizations money through flexible deployment options that offer choices regarding how much of the data protection infrastructure they want to own, and how they want to pay for it. IBM’s intuitive and easy-to-deploy software tool helps generate detailed reports on return on investment (ROI) and total cost of ownership (TCO) from its analyses of infrastructure and backup needs. This white paper addresses how IBM data protection solutions can help organizations save money while addressing modern data protection challenges.